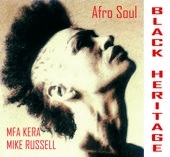 Mfa Kera and Mike Russell's Black Heritage: Talking Africa offers an exciting mix of african influenced original compositions in styles from throughout the African Diaspora. The standout performances of charismatic vocalist, creole from Madagascar Mfa Kera and superb guitarist / vocalist from Washington, D.C., Mike Russell with special guests like TM Stevens, Themba Maxwell Mntambo and more introduce the listener to a captivating original journey through grooves, situations, landscapes and sounds. A must for any fan of Soul, Funk jazz Afro fusion. The bonus track Moringa Ananambo is the musical theme of Mfa Kera's project The Power of the Music to reconcile Mankind with Nature. A reforestry project started in Madagascar and going internationally. 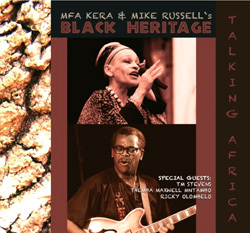 BLACK HERITAGE offers a unique blend of original compositions in idioms from all over the African Diaspora, performed with high-level musicianship and conviction, and great soloists. Well received by demographics favoring Jazz, Funk, World, and more. "Afro Soul" - a unique and powerful blend of African rooted music, texts and sounds with Soul and Rhythm & Blues.